The latest Channel 4 film on Sri Lanka dwells on four points, most of them expanded versions of what it claimed previously. Once again, actual evidence in the form of documents dating from the period concerned, indicate how selective it is. Channel 4, following the Darusman report, talks of bombardments on a UN camp from January 23rd on. Unlike Gordon Weiss, who mentioned the same incident but without a date, attributing information to retired Colonel Harun Khan, from the UN Secutiry Office, Channel 4 now finally mentions its purported informant, an Australian called Peter Mackay. There was no Peter Mackay in the list of those going on the convoy supplied to the army. Apart from Harun Khan, the only UN officer supposed to be in the convoy was a local employee called Mr Suganthan. 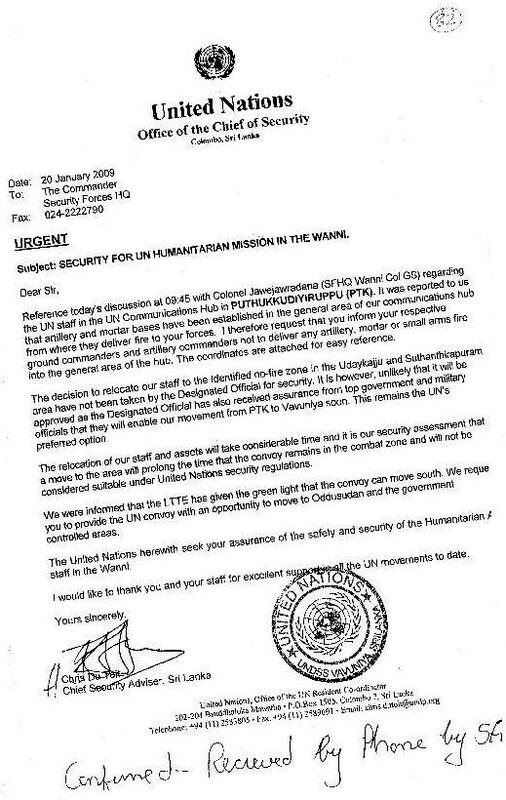 In contradiction it seems of the Channel 4 claim, the UN Security Chief wrote to the Security Forces on January 24th as follows – ‘I would like to thank you and your staff for excellent support in all the UN movements to date’ (it must be noted that Harun Khan had stayed behind without authorization, when the rest of the convoy left on January 20th, in order to persuade the LTTE to let local staff who were working in the Wanni leave). So who was Mackay, where did he come from, and where did he get his footage? He may well have been there, but the fact that his presence was never informed to officials is suspicious in itself, given too his position at UNOPS which had had a number of staff with LTTE sympathies, for whom the UNOPS head had apologized (for instance Benjamin Dix whom Amnesty had taken round Geneva in a show and tell performance during an earlier sessions of the UN Human Rights Council). It should be added that the deaths of civilians occurred largely because of the strategy of using civilians as human shields, and then fighting from amidst them. 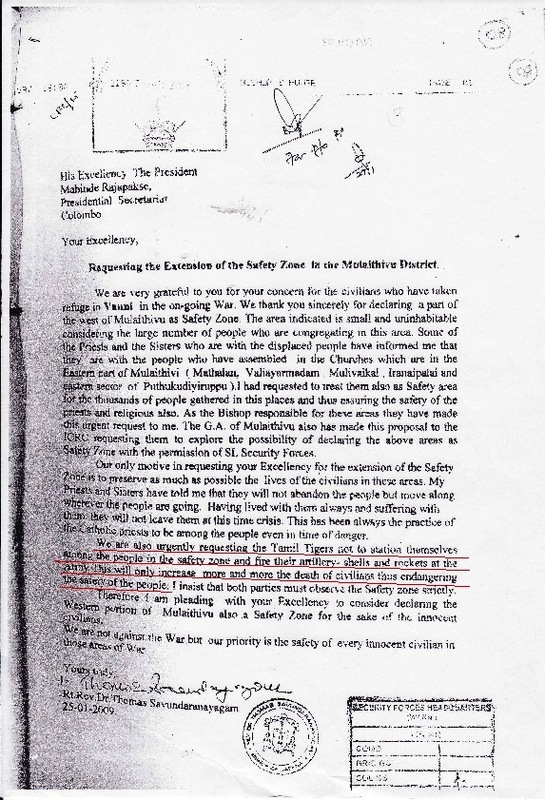 We were aware of this from the start, given the evidence of the Bishop of Jaffna who wrote on January 25th that ‘We are also urgently requesting the Tamil Tigers not to station themselves among the people in the safety zone and fir their artillery shells and rockets at the Army’. The 25th was the first day in which Tamilnet, which I had monitored carefully from the Peace Secretariat, claimed casualties of more than 20 from army action (the total of civilian casualties alleged by Tamilnet in the last 7 months of 2008 had been 78). On the 26th we had three figure allegations for the first time, but that was when we also got an SMS from the head of the UN in Colombo to say that they believed most of the firing came from the LTTE. That SMS was kept on my phone for a few months so that I could show it at the next session of the Human Rights Council in Geneva, when the usual suspects made their extravagant allegations. What the LTTE was doing did raise serious moral problems, and I believe that in general our forces dealt with these in a humane way. 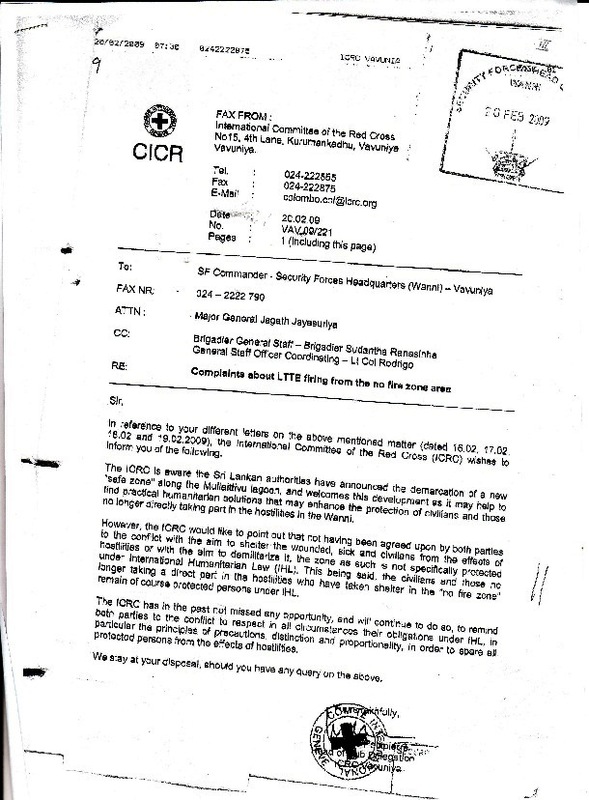 We did keep asking the ICRC to tell the LTTE to stop using this tactic, but while they said they would continue to remind both parties to the conflict of their obligations, they pointed out that ‘not having been agreed upon by both parties to the conflict, the zone as such is not specifically protected under International Humanitarian Law’. Civilians of course continued to be protected under IHL, but this does not take away from the right to fire back when under attack. A letter from the UN head of security, Chris du Toit, indeed makes the dilemma obvious. He wrote on 20th January that ‘artillery and mortar bases have been established in the general area of our communications hub from where they deliver fire to your forces. I therefore request that you inform your respective ground commanders and artillery commanders not to deliver any artillery, mortar or small arms fire into the general area of the hub’. In other words, the LTTE is firing on you, using us as a shield, but please do not fire back. Du Toit’s concern for his staff is admirable, but it is a form almost of giving the LTTE a blank cheque. But our forces did exercise maximum care, and no one in that UN convoy was hurt. Indeed, not one of the UN workers who were forced by the LTTE to stay behind was hurt, except for one person whom the UN head, Neil Buhne, told me in Geneva was probably injured by LTTE action, and whom the forces looked after immediately. 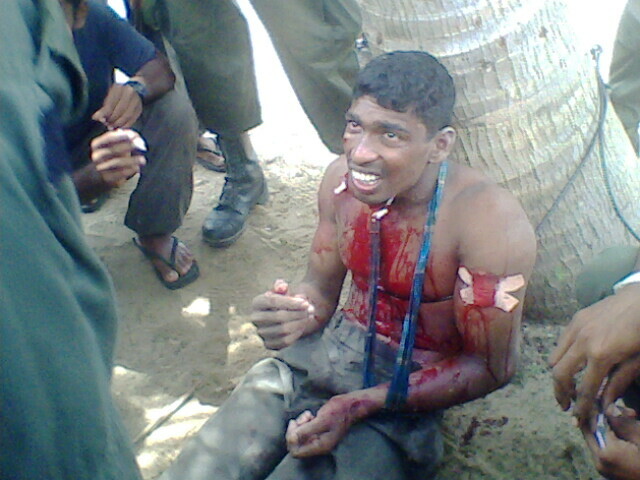 The narrative of a civilian who was one of the many forced to retreat with the LTTE in April/May 2009. Secondly, Channel 4 talks about deliberate shortages of supplies, and invokes the sacred evidence of David Miliband in this regard, a man who, according to Wikileaks, had been concerned about Sri Lanka for selfish electoral purposes. The Sri Lankan government has indicated the supplies that were sent, in accordance with the figure supplied by the UN. Many people calculated the possible figure in different ways, and many got it wrong, but the Commissioner General of Essential Services worked always to the same figures, while also ensuring that extra medicines were sent. I myself saw bags of rice that had been used to make bunkers, which suggests that if there were shortages, it was not due to us. But in any case the figures speak for themselves. Mr Miliband’s calculations suggest that everyone would have been dead if so little food was sent in that period, but we know that over 250,000 escaped. In addition, I have seen the medicines that were in the hospitals, and doctors who worked there, including in the LTTE hospitals for their cadres, told me they had adequate supplies including anaesthetics. Thirdly we have the same old Channel 4 video, which we have conclusively proved was doctored. Beginnng with the original claim that the scene was filmed in January 2009, which was the date the US State Department also put to us in its document of allegations, there has been fraud and sleight of hand. Ridiculously, Channel 4 now brought to corroborate its claims a member of what is called Journalists for Democracy, which had originally supplied them with the video. So much for independent witnesses! The UN has also indicated that the second film shown was edited, and edited backwards, while the zooming suggests it was done by a video camera, rather than the mobile phone that was claimed. Certainly, as the LLRC recommends, we should investigate further, but to do that Channel 4 must cooperate by at least sending us the original – which they refused to do even to the UN, which then got a different version from Journalists for Democracy for its own investigations. Why such suppression of evidence and blatant falsehoods, if they believe this is genuine. I should note that another gruesome picture showed was one I first saw in Australia, when I pointed out one of the people purportedly doing the torturing was in rubber slippers, suggesting that this was an LTTE effort. Subsequently the slippers have been cut out when the picture is shown, but I do still have that original version. Finally, they show the picture of Prabhakaran’s son, and claim he was killed on orders from higher up. In fact that picture has been in the public domain since 2009. While of course the matter should be investigated, the efforts to connect it with the President are absurd. This is not like what happened when Osama bin Laden was killed in cold blood, clearly on the orders of the American Commander in Chief, since he was privileged to have a bird’s eye view of the proceedings. The Americans may have thought the killing of Osama was justified, as revenge, or what they see as justice, but it was not a killing in combat, and was certainly not just. But one does not see any claims that he should be held accountable, for the simple reason that, as Mao Tse Tung once said, power comes out of the barrel of a gun, and the guns used against what is termed Islamic terrorism are larger than those of anyone else. I should add that there were more horrors connected with the death of Osama bin Laden, including the justification offered by the celebrated Nazi hunter Elie Wiesel, who claimed that, though children had been put in harm’s way, and ‘children are never guilty. Still, it was bin Laden himself who placed them in harm’s way’. I hope we never use such justifications, and that any allegation of killing will be looked into. But when America provides such glib justifications for its actions in executing bin Laden, surely there should be greater stress on the wickedness of the Tigers in the systematic use made of civilians as human shields. But, in its relentless efforts to target the Sri Lankan leadership, this is not an issue for Channel 4. “I managed the war like a true soldier. I did not make decisions from A/C rooms. I was under pressure to stop the war even during the final phase. I got messages not to shoot those who are carrying white flags. A war is fought by soldiers. They do so by putting their lives on the line. Therefore, the decisions about war should be taken by the soldiers in the battlefront. Not the people in A/C rooms in Colombo. Our soldiers have seen in life the kind of destruction carried out by those people before they decided to come carrying a white flag. Therefore, they carried out their duties. We destroyed any one connected with the LTTE. That is how we won the war,” Fonseka said at an event held in Ambalangoda to felicitate him on July 10, 2009. I believe government was wrong not to investigate this claim. 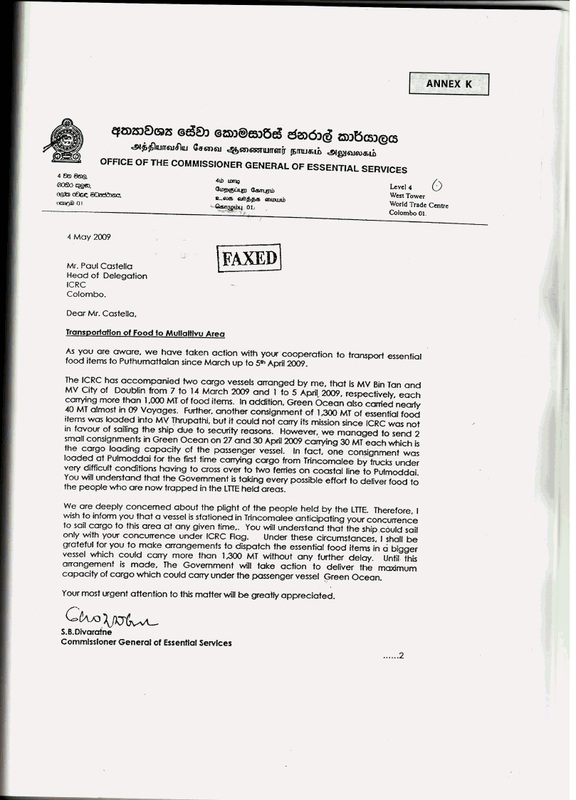 It is possible that the claim is untrue, but it is also possible that, as with other matters one had to deal with during that period, such as the declaration that government planned to increase the size of the army by 100,000, Fonseka was advancing his own ideas which were at odds with government policy. It is even possible that he wanted to take credit for things with which he had no connection. But while I find strange the evident determination of the forces to shield him from inquiry in this regard, I find even more bizarre the manner in which the Americans have now taken him to their hearts. I was told by a senior politician that a senior American diplomat claimed that they had now found a new weapon with which to threaten government, namely Sarath Fonseka, and that explains his apotheosis into an admired Presidential candidate soon after the Americans had laid their evidence about him on the table. But such weapons have a habit of backfiring. That Channel 4 and Sam Zarifi now leave him out of their cries for vengeance and concentrate on civil leadership makes it crystal clear what the current agenda is.